In the first paragraph of the 32-page liner notes to "A Cappella" we learn that "a cappella," translated from the Italian, means "in the style of the chapel," probably a reference to the Sistine Chapel in Rome, where a tradition of unaccompanied singing has gone on since the Renaissance. 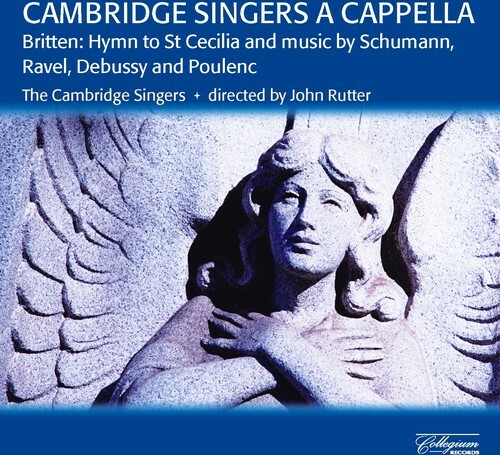 Although the meaning of the term has since expanded to include unaccompanied secular music, it's clear that the Cambridge Singers hold to the original meaning, as none of the music on this CD would sound out of place under the Sistine's famous ceiling. Directed by the renowned John Rutter, the CS bring us the finest sacred music, first 11 songs from England and Germany, then 14 songs from France, all written in the 19th and 20th centuries. We have Britten's "Hymn to St. Cecilia," four songs from Brahms' "Vier Lieder aus dem Jungbrunnen," five songs from Schuman's "Vier doppelchorige Gesange, Op. 141," R.L. Pearsall's "Lay a Garland," Frederick Delius' "The Splendour Falls on Castle Walls," Ravel's "Trois Chansons," Debussy's "Trois Chansons de Charles d'Orleans," and eight songs from "Chansons Francaises." As most of the lyrics are in German or French, it's nice to have the extensive liner notes with all the words and translations. Beautiful music, angelically sung!